McMinnville City Hall is located at 230 NE 2nd Street, McMinnville, OR 97128; phone: 503-434-7302. Photo: Frank W. Fenton House, ca. 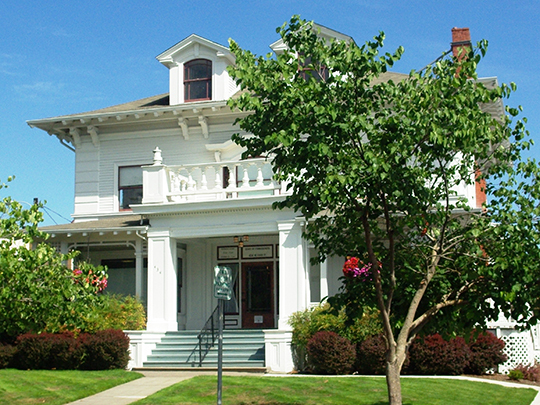 1909, 434 North Evans Street, McMinnville, OR. Listed on the National Register of Historic Places in 1983. Photographed by user:M. O. Stevens (own work), 2009, [cc-by-3.0 (creativecommons.org/licenses/by/3.0)], via Wikimedia Commons, accessed January, 2014. McMinnville is located at the confluence of the North and South Yamhill Rivers which, together, merge to form the head of the Willamette River. McMinnville, seat of Yamill County, is the trading center of a prosperous agricultural area. It was named by William T. Newby, a native of McMinnville, Tennessee, who came to Oregon in 1844, built a grist mill, and established the town. The town now has a large milk condensing plant, a sash and door factory, two saw mills and a brick & tile factory. It was one of the first in the state to own and operate its water and light systems, and its record on public utility management is frequently cited.